Our Wall Stencils allow you to create a look of expensive designer wallpaper for much less. 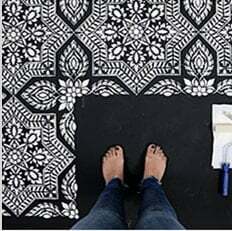 Wall stencils are reusable, so you can stencil an entire room with just one stencil. We professionally design our Wall stencils in a such a way that it's very easy and intuitive to use, even for beginners. Each stencil has a built-in registration, meaning you can easily align your next stencil repeat with the previously painted parts of the design. We suggest using flat latex paint for both stenciling and your base paint. This way, paint dries very quickly, doesn't smear and you don't need to wait for the previous stencil repeat to dry. You can use stencil roller or stencil brushes for stenciling. With wallpaper, you're limited with color choices and also stuck with a hefty price tag. With Wall stencil patterns, you can choose any color you want, perfectly matching your existing decor. Stenciling is a satisfying, creative experience and the wall stencil technique is easy to learn and master. Please watch our How To Stencil Walls video tutorials and paint a beautiful accent wall in your space with our reusable wall stencil patterns! For stencil inspiration, please visit our Stencil Ideas Gallery!